What you think you've known about history is a lie. There's a war going on over control of reality itself. And the horrors of confronting the truth are almost as bad as the consequences of remaining ignorant. It's time to join Project SANDMAN and fight for your beliefs. 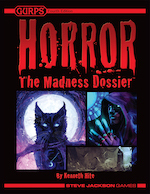 Welcome to the world of GURPS Horror: The Madness Dossier! From the realm-crossing mind of Kenneth Hite comes a campaign setting that mixes thrills, intrigue, and a clash of realities to prove that "high power" and "horror" can merge for insanity-inspiring possibilities. It includes the real history of the world (and other truths that have remained hidden); templates, roles, tools, and gear for the heroic protectors of reality; detailed information and GURPS game-stats for the terrifying forces that threaten humanity; and more. Tap arcane forces, alter minds, and shift perceptions -- either to reinforce our reality, or help it slip away to an alternate history where humanity is enslaved. Download GURPS Horror: The Madness Dossier today, and join the fight to keep the horror at bay for another day. The madness awaits . . . and it's only at Warehouse 23!